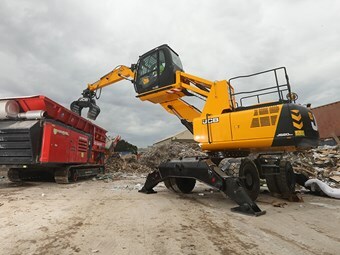 The JCB JS20MH Wastemaster, a materials handler which allows the waste industry to handle both landfill and recycling operations, has been launched in Australia by distributor JCB CEA. The JCB JS20MH Wastemaster materials handler. The 20-tonne machine has a host of features including a range of protective guards, a hydraulically operated high-rise cab and a specialised engine cooling pack. The new model has arrived at the ideal time as the Australian waste management market is starting to move from a landfill to a recycling model, JCB CEA excavator product manager Deon Cope says. "The JS20MH can work in both types of operation so it’s perfectly matched to the needs of the industry now and into the future," he says. "The increased visibility from the high-rise cab means the handlers can easily pick out and separate specific pieces of waste. This degree of control is going to make a huge difference in waste facilities where it’s becoming more important to be able to carefully sort materials. 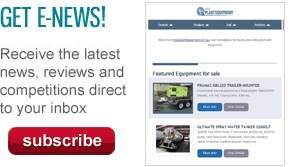 The bird’s eye view also makes it easier for operators to avoid over- or under-loading trucks." The JS20MH Wastemaster has been designed for ruggedness and durability, Cope says, "with guards to protect vulnerable components and hoses and a completely new undercarriage which offers excellent all-round stability and uniform lift performance throughout the machine’s 360-degree rotation". The JS20MH, which is powered by a 93kW JCB Ecomax T4i engine which operates without a diesel particulate filter, comes standard with a 5.7m straight boom. Also available are a 4m gooseneck dipper for scrap work or a shorter 3.6m straight dipper for waste applications. Operator safety is important in this high-risk industry, so the JCB JS20MH Wastemaster has a FOPS cab with windscreen and roof guards. The operator is kept cool with air conditioning and the engine is kept cool with an ‘intelligent reversible fan’, a scavenger system on the air pre-cleaner for additional filtration, and a wide core cooling pack. "Waste operations are heavy-duty environments where overheating can be a significant issue, so this model is deliberately engineered to minimise the risk," Cope says. In addition to the purpose-built JS20MH, JCB also offers its TLT35D teletruck and 541-70WM telehandler with the Wastemaster specification package, which allows the machines to meet the particular needs of scrap and waste handling.